My autographed Max Scherzer card from the 2015 Cards for a Cause program. Last year, during his first season with the Washington Nationals, ace of the staff Max Scherzer launched a charity called Baseball Cards for a Cause. Max autographed fans’ baseball cards in exchange for a donation to the Washington Nationals Youth Baseball Academy. This was a fundraiser Max and his wife, Erica May-Scherzer, started when Max was in Detroit on the Tigers, and I think that it’s great that the Scherzers brought it with them to Washington. I participated in the fundraiser last year, and thought it was a fun way to support a great cause. I now have in my collection the autograph of one of baseball’s best pitchers, and it’s even personalized to me. I had a chance to talk with Max and Erica about their charities, and Max answered the most important questions about his autograph signing programs. This year, the Scherzers are expanding their autograph and fan engagement programs to help even more charities. In addition to participating in Cards for a Cause again this year (more details on the expanded program below), there are three more ways he’s helping the community: Autographs and Athletes, Strike Out Modern Slavery, and The Scherzer Showdown. I’ll explain each one below and the different worthy causes each supports. Fans paying close attention on Twitter may have noticed recently that Max has already started signing some of the items that have been mailed in. Strike Out Modern Slavery– Also in support of Polaris, Max is organizing a pledge drive for each strike out this season. As Nats fans know, Max can serve up quite a few strikeouts– as many as 20 in a single game! Fans are encouraged to make a pledge on the website (as little as $0.31 a strikeout), and Max and Erica will match all donations up to $25,000. Everyone who pledges is entered into a drawing to win Nationals prizes like Scherzer-signed baseballs and Nationals tickets. For more information and to pledge a donation to Polaris, visit pledgeit.org/maxscherzer. So far, this charity has raised just under $10,000. The Scherzer Showdown– For the second year in a row, Max Scherzer and fellow Nationals teammates are hosting a fantasy football draft benefiting the Washington Nationals Youth Baseball Academy. Sponsored by the Washington Nationals Dream Foundation, the Youth Baseball Academy (“YBA”) teaches DC area kids about how to stay healthy and have a good education. The YBA integrates the STEM curriculum into baseball, like teaching math using Nats’ player batting averages. “They are such a well run organization that is focused on at-risk youth development,” Erica told me. “I was very excited when Max signed with a city that had a youth academy. Sports have such power beyond the field and can truly make a life changing difference in countless kid’s lives.” When you sign up for the Scherzer Showdown, not only do you attend a fantasy football draft with Max and his teammates, but fans play fantasy football with the players all season. This is such an awesome idea for a fundraiser, and a great way for players to interact with their fans. For more info and to sign up for the draft, visit scherzershowdown.com! Cards for a Cause- The Cards for a Cause autograph program is back for 2016, but a little different this year. By making a donation to the Nationals Dream Foundation, fans will receive a limited edition Dream Foundation baseball card, presented by TOPPS, which will be autographed by your choice of Max Scherzer, Jonathan Papelbon or Shawn Kelley. It will also be authenticated by MLB. At the end of the regular season, Scherzer, Papelbon and Kelley will will match all funds raised by their individual baseball card with a charitable donation of their own. It’s great to know that the stars of our hometown baseball team like to give back to the community and to charities that mean a lot to them. I strongly encourage you to help them out, and maybe get a nice autograph for yourself or a friend. As I wrote about here, I was recently diagnosed with Type 1 Diabetes. Ever since I got my diagnosis, I’ve been looking around to find inspiring people who share the same burden I do. I learned that rookie winger for the NHL’s Arizona Coyotes, Max Domi, is also a diabetic. When the Coyotes came to play the Capitals last week, I couldn’t miss the opportunity to grab this interview with Max. The Coyotes invited me to their closed workout at the Verizon Center, and afterwards I got to ask him a couple questions about how he deals with diabetes. There’s nothing you can’t do when you have diabetes, but being a professional athlete is one of the hardest things you can do. As you’ll see below, Max describes the complicated routine he goes through during a game to make sure he stays healthy. Before we get to this Matt’s Bats Chat, let me tell you about the day. One of the best parts of the interview was the part before it! The practice began at 11:30 a.m. on Monday, February 22, which meant that I got to leave school early to go to Verizon Center. Because the practice was closed to fans, the only other people in the entire arena were beat writers for the Coyotes. We took some great seats right behind the visitors bench behind the glass and right next to the player tunnel. Being that close to the ice meant you could see every detail on Louis Domingue‘s helmet and almost get sprayed with ice as Shane Doan skated by. Some players gave me high fives or said hi as they walked onto or off the ice. We had a great view watching Oliver Ekman-Larsson take a heavy slap shot or watching Anthony Duclair and Max Domi having some fun stick handling. By the time practice was over, the Coyotes’ Director of Media Relations took us down to the locker room to interview Max. I knew I was going to get to meet the rookie phenom, but I didn’t know I was going to be interviewing him in the locker room! That was a great surprise because even though I’ve seen the insides of many stadiums, I have never done an interview in a locker room. I was able to see everything that goes on behind the scenes at a hockey game. For those of you who don’t know Max Domi, he is a 20-year old right winger for the Arizona Coyotes. He made his NHL debut this season after being drafted 12th overall in the 2013 NHL draft. He has already scored his first NHL hat trick. Domi is the son of former Toronto Maple Leafs player Tie Domi. He wears #16 on his jersey as a tribute to hockey legend Bobby Clarke, who made 8 consecutive All-Star Games, and is a 2-time Stanley Cup Champion. Clarke also also has type 1 diabetes. Matt’s Bats – How did your diabetes diagnosis effect your road to the NHL? Max Domi – The first question I asked after I was diagnosed was whether I could still play hockey and the doctor said, yes, of course. After he said that, I didn’t let the diagnosis phase me. Now I’m lucky enough to be here playing 4 years in the OHL [Ontario Hockey League], which is a junior league in Canada. I learned a lot and had a great time. I’ve learned a lot about how to live playing hockey with the disease. Now I’m here and doing OK.
MB – I’ve learned that you have a diabetic alert dog named Orion. How does he help you deal with the disease? Max with his service dog Orion. Photo from Instagram. Domi – He can alert me when I go high or low [meaning when he becomes hyper- or hypoglycemic]. So when my blood sugar goes out of range, Orion comes up to me and nudges my waist and grab this thing that I wear on my belt buckle and he’ll just sit there and look at me. When he does that, I know that I’m either low or high. In the middle of the night, as well. He’ll be a normal dog, but he’ll wake me up if my blood sugar goes out of range. He’ll lick my face until I wake up. The good thing is he can catch stuff before it gets to be a problem and dangerous, and he’s good at it. To read more about Orion, including a video of how he helps alert Max to dangerous blood sugar drops, I recommend this article. MB – That’s amazing that he can do that. Was he trained? Domi – Yep. So, I got him when he was 2 years old, but it takes a minimum of 2 years to train a dog. Obviously, with the obedience thing, you can bring him in public. He’s a service dog, so you just throw on his vest and he can go anywhere with you. The scent work takes a while. 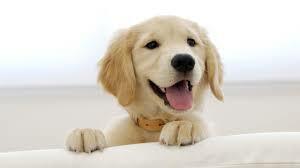 And all the standard stuff to train a dog. MB – What’s your routine in terms of managing diabetes before, during and after a game? Domi – There’s a couple things I have to do. I’m making sure I’m eating at the same time or almost the same time on game days as practice days and workout days. And then testing my blood pretty frequently. So, I’ll test my blood 2 hours before the game, an hour before the game, right before I warm up on the ice before the game, half-way through the first, after the first, half-way through the second, after the second, half-way through the third, after the third, and then two hours after the game. MB – That’s a lot! Domi – It is a lot, but, I mean, it makes me feel better and a little more confident with how I feel, so I do that and it works out pretty good. MB – Do you wear a pump? [Ed. note: Diabetics need to take insulin in order to process the food they eat. You can’t take insulin in a pill, so you either need to inject it using a syringe or use an insulin pump that you wear on your hip]. Domi – Yes, I do. Domi – Nope. I broke a couple, though. I’ve actually blocked a shot and it shattered the whole screen. There’s a 1-800 number I can call on the back, and within 2 ½, 3 hours they’ll send a brand new one. If anything were to ever happen and I couldn’t get one right away, I have these protocols where I’d go back to injections and manually do that stuff. There are a couple different settings that the pump can do that injecting can’t do. I have a lot of stuff so in an emergency I can manage it without any issues. MB – Is wearing a pump better than using a syringe, being a professional athlete? Domi – No. It’s definitely not better. But everyone’s different, obviously. It’s just a matter of finding what makes your life easier and more manageable. For me, the pump’s been great. I’ve had some issues with it, but you find a way to manage those and keep living your life. For me, it’s been going pretty smoothly with the pump, so I’ll keep it up for now. MB – What do you do to raise awareness about the disease? Domi – To be honest, I’m more involved with the Canadian side. There’s this one company, Bayer, which makes the Contour Link meter that I use to test my blood. They’re a pretty wealthy organization, so I’ve been able to partner with them and make some videos, and tweet some stuff out, and post on Instagram. They’re all on board. The JDRF is huge as well; they’re great at raising awareness and raising money and trying to find a cure. We’re going in the right direction, and hopefully we’ll find a cure. MB – I remember seeing a post you put on Instagram a couple of months ago that said you would donate $1 for every like you got. I think that was very good for the diabetes community. At this point, goalie Mike Smith came into the locker room and took a seat on the bench at his locker across from us. He took some ice from his skate and threw it at Max as a joke to distract him. “Don’t mind him. He’s trying to get me wet,” Domi said. Domi – Yeah, that got a lot more than I was anticipating, but, hey, that’s great. We’re raising awareness and did a good job. MB – The more the better! Now just some general questions. What is your favorite moment ever playing hockey? Domi – My first NHL game was pretty cool. World Juniors last year was pretty cool. I was lucky enough to play for Team Canada and we won the gold medal in Toronto, which is where I grew up. So that was pretty sweet. Those two are pretty much tied, I think. MB – And, finally, what’s been your favorite arena to play at in the NHL? Domi – I haven’t played in all of them yet. The rink in Toronto is pretty sweet. The ACC [Air Canada Centre in Toronto] is awesome, but I’ve only played their once. That’s probably my favorite, just because I grew up around there. I haven’t played in many Eastern rinks yet, but the one in Phoenix is pretty cool. They’re all really good nowadays. It’s fun. I’m looking forward to playing in the Verizon Center tonight. MB – Max, thank you so much. Domi – Alright, buddy. Thank you so much. That was great. A pleasure. 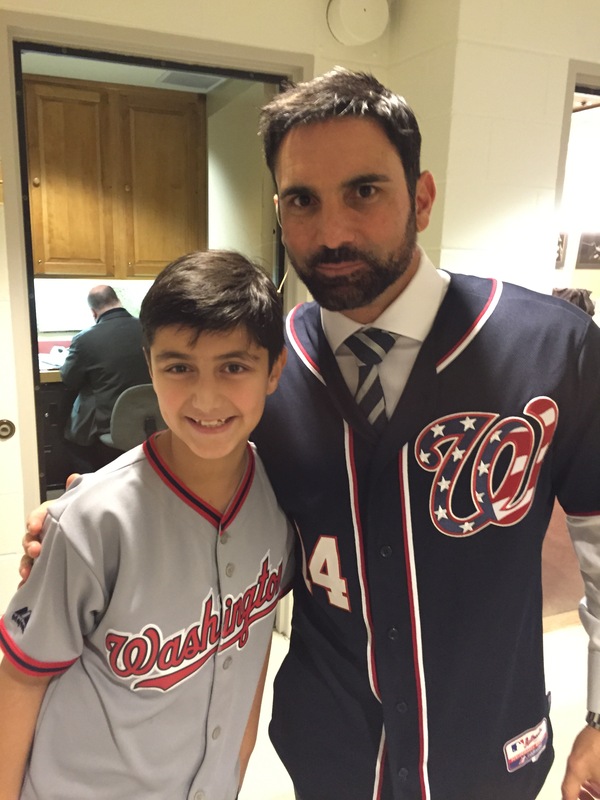 It was great meeting Max to talk about how he is a role model for others who have diabetes. I also got to take home a souvenir: a stick from center Viktor Tikhonov, and a puck they used during practice. I returned to the Verizon Center later that night for the game. Even though I was rooting for Max, the Caps won 3-2. 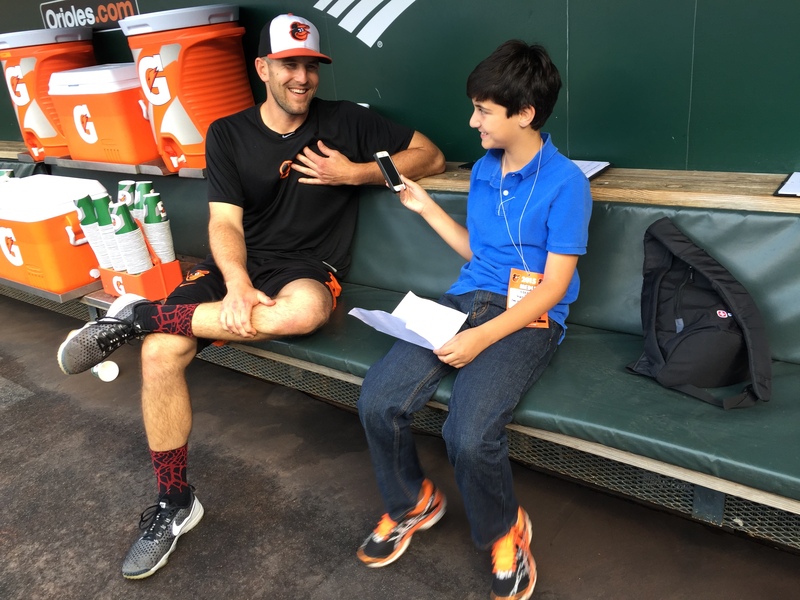 Last month, I had the great opportunity to interview Orioles relief pitcher Darren O’Day. In the first part, I interviewed O’Day about his community service to military service members and family as a nominee for the Bob Feller Act of Valor Award. In the second part, I talked to him about baseball topics, like how he developed his signature sidearm delivery. Here is the 2nd part of my Darren O’Day interview! Matt’s Bats: When did you start playing baseball? Darren O’Day: I first played organized baseball when I was five. I’m 32 now. I guess that makes me old! I’ve been playing for a long time. I took one year off in high school. Its been the one constant in my life as long as I can remember. MB: What values can baseball teach kids? DOD: First of all, it keeps you out of trouble. If you’re busy practicing and you’re busy playing catch and hitting batting practice, you’re not going to be out doing things you shouldn’t. The game teaches you to get to know different personality types. If you play athletics you know how to get along with other people. You’re not going to succeed in athletics unless you work hard. That’s proven – the higher up you go the harder you have to work. There’s not many lazy Major Leaguers. There’s a lot of applicable things you can learn in sports. MB: You’re going into the off-season as a free agent for the first time. What is that like? DOD: You’re right, it’s the first time I’ve been potentially a free agent. I’ve been on four different teams already so I kind of know what its like to be in different places. You never really know what’s going to happen. It’s tough because I have a wife and a child and two dogs, so there’s a lot of things to consider, like where they would be happy. I might come back here [to Baltimore], I might go someplace else. You never know! MB: Another new thing for this year was your first All-Star Game selection. Congratulations on that! DOD: Thanks for that. I never knew if I was going to be in the Major Leagues, first of all. And I never thought I would be an All-Star! But it was a really cool honor and I’m glad I did it. I had a lot of fun. MB: You throw side-arm, one of the few baseball pitchers that does that. But every coach I’ve ever had has encouraged us not to throw side arm. How did you start throwing side arm? DOD: You have good coaches, then. You don’t want to screw around throwing side arm until you figure out you’re not very good at overhand. I threw overhand my whole life, all the way through high school. I tried out for my college team and didn’t make it throwing overhand, so I thought I was done with baseball. But I screwed around throwing side arm, figured out I would try out again, and this time I made the team. I played for four years in college and its been an interesting career. MB: How did you master the side arm? DOD: Everybody can throw side arm, but not everybody can throw strikes. Its like anything else. If you tried throwing left handed, you wouldn’t be very good at first. But if you kept practicing and practicing you’d get pretty good. I know it seems hard, but you could do it. I’ve also had some good coaches along the way. I’ve been doing it so long I probably know the side arm motion better than a lot of the coaches now. Its been a lot of hard work, a lot of video, a lot of repetition. And I learn as I go. MB: When the Orioles were down in Washington, you witnessed the incident between Jonathan Papelbon and Manny Machado. [Jonathan Papelbon was ejected from the September 23 Nationals-Orioles game for throwing chin music at Manny Machado]. What are your thoughts on the big dugout fight between Papelbon and Bryce Harper? DOD: Baseball is a funny game. Different people have different interpretations about what is right and what is wrong. It’s unfortunate the Papelbon-Machado incident is what came out of that series, instead of the news being us [Orioles] sweeping the series. Sweeping the series was the big story for us and for our team. It shows that guys care and that they love what they do and they are passionate about it. As for what’s going on between Harper and Papelbon, I can’t speak with any authority about what’s going on there. Thanks for reading the latest Matt’s Bats Chat. I will have some more posts coming out in the next couple weeks. Next week, I will be covering the third annual Bob Feller Act of Valor Award, where I expect to bring you another Matt’s Bats Chat with Brewers catcher Jonathan Lucroy and other celebrities. ALSO, stayed tuned for one of my favorite posts of the year: my Holiday Gift Guide around Black Friday. If you are buying gifts for kids or adults who like baseball, you will definitely want to read this before you buy anything. And some companies have given me some giveaways for readers, and you could win some really cool things. So stay tuned to MattsBats.com throughout the off-season! Last week, I had a great opportunity to go to beautiful Orioles Park at Camden Yards in Baltimore, Maryland to interview Orioles closer Darren O’Day about his nomination for the Bob Feller Act of Valor Award. O’Day was honored for his award nomination at a pre-game ceremony. During our interview, I also asked him a few questions about other topics, including his upcoming free agency and his unique submarine delivery, which will I will publish in a later post. 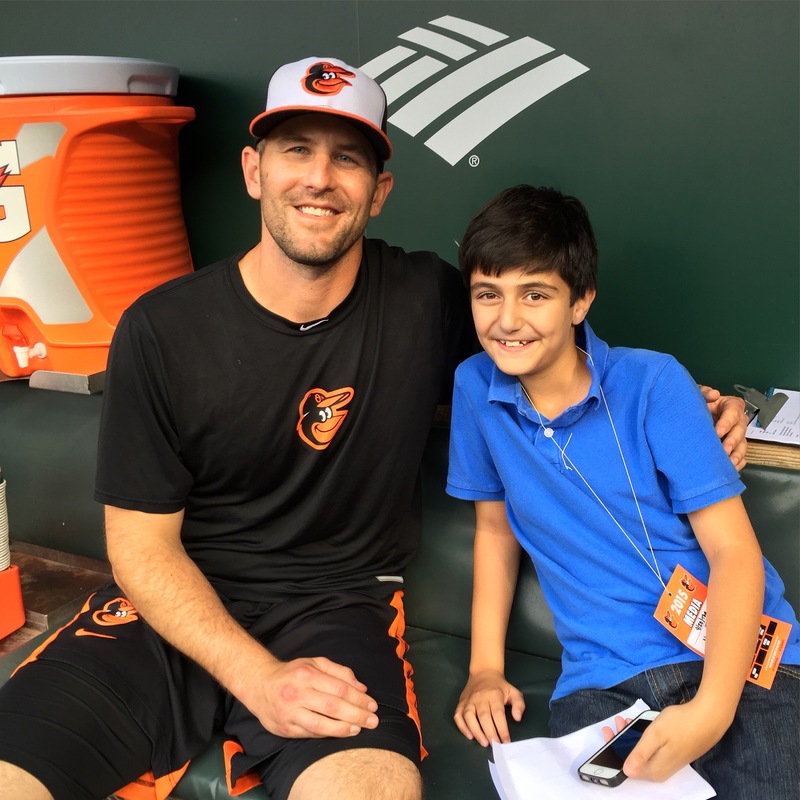 This Matt’s Bats Chat with Darren O’Day is about and his work helping military charities and his nomination for the Bob Feller Act of Valor award. The Act of Valor Award is given out to three people who share the characteristics of Bob Feller: an active MLB player, a member of the Navy, and a member of the National Baseball Hall of Fame. Award winners are selected because they are dedicated to serving our country and share the values and integrity of Bob Feller. In addition to the Orioles’ O’Day, other MLB nominees this year included Brad Ziegler of the Diamondbacks, Dustin Pedroia of the Red Sox, Adam LaRoche of the White Sox, Jay Bruce of the Reds, Trevor Bauer of the Indians, Jonathan Lucroy of the Brewers, Wade Davis of the Royals, Steve Cishek of the Cardinals, Brian Dozier of the Twins, Curtis Granderson of the Mets, Sean Doolittle of the A’s, Charlie Morton of the Pirates, Ian Kennedy of the Padres, and Craig Stammen of the Nats. The winners will be honored at an award ceremony at the U.S. Navy Memorial in downtown Washington, DC in November. I asked O’Day what it means to him that he is nominated for an award named after the great Bob Feller. “It’s truly an honor. When I heard I was being nominated for this award, I went and researched him. The more you learn about him, the more in awe you are of his decision to take time off from Major League Baseball to serve in the Navy. He gave up four years of his career to potentially get hurt or die in the line of duty. Like I said, it’s a great honor to be associated with an award in his name.” O’Day told me the story about the opportunity he when he was 6 or 7 years old to meet Bob Feller at a minor league baseball game in his hometown of Jacksonville, Florida. O’Day handed Feller a pen to sign an autograph for him, and it exploded on him! O’Day has done many terrific things that earned him this nomination. One of the things O’Day and his wife, FOX News reporter Elizabeth Prann, have done is organize a “Barbecue for the Troops” event that helps support the USO. O’Day explained the whole process to me. He told me that he sponsored the event at Camden Yards and guests brought donations for the USO. In the event’s inaugural year in 2013, O’Day raised $17,000. The USO is great because it helps deployed troops and their families. Another activity O’Day and some other Orioles help out with is the Military Sunday Suite. Orioles players donate money to buy a suite every Sunday at Orioles Park for active military members, and they get to meet some players during batting practice, get a t-shirt, and are recognized during God Bless America and the 7th inning stretch. “The sacrifices they make and the things they have to forgo to serve in the military, we couldn’t make up for that. Tickets to a game pale in comparison to that. We couldn’t really make up for that, but we try to do something small and do something nice,” O’Day told me. That’s not all O’Day does to support the military. He also supports a cause called Luke’s Wings, and for the past three years he has donated money for every strikeout he records. Luke’s Wings helps families travel to be with injured service members during their hospitalization and rehabilitation. “I like their mission. When somebody decides to serve in the military, it not only affects them, it affects their whole family.” “When a service man or woman is injured, they have a lot to deal with, and their families also have a lot to deal with. Luke’s Wings takes care of their families and provides funding to get them flown out whereever they need to go to see their injured family member. It makes it a lot easier on the family to take a lot of the financial burden off them.” In 2013, O’Day raised over $2,300; in 2014 he raised over over $3,600, and this year he will donate over $4,000. “I wish I would have raised more, because that would’ve meant more strikeouts,” he joked. The Bob Feller Act of Valor Award foundation just announced the winners of this year’s awards. This year they are celebrating Brewers catcher Jonathan Lucroy, Hall of Fame Royals 3rd Baseman George Brett, and Navy Chief Petty Officer Gennell Cody. Although O’Day didn’t win this year, he still has done many great things and I hope to see him nominated again next year. I will attend the awards ceremony again this year and have interviews with Lucroy and Brett. In addition, look out for the rest of my Matt’s Bats Chat with Darren O’Day, coming soon. We talk about more about his baseball career. Spring has sprung for baseball fans, with pitchers and catchers reporting for Spring Training this week, but that doesn’t mean that it is warm outside. In fact, it’s a snowy Saturday as I’m writing this. I hope you’re also sitting by a fire and reading this. 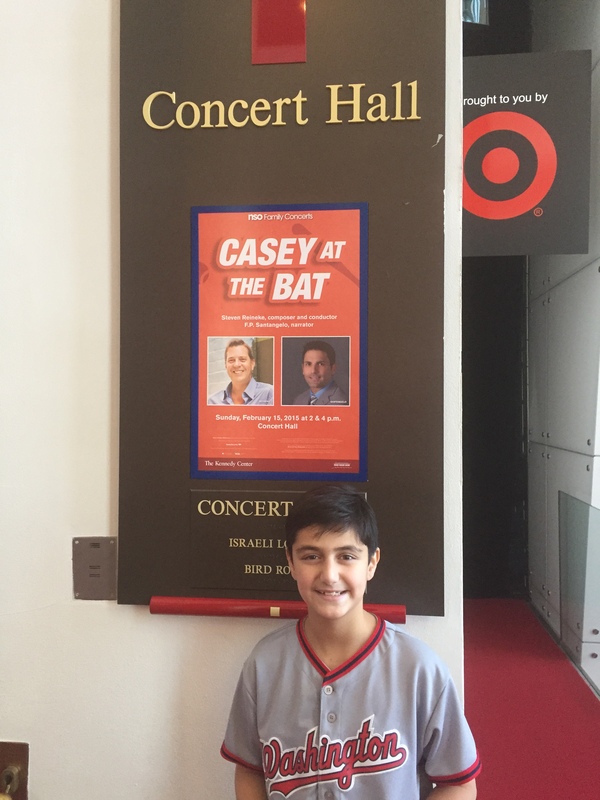 On Sunday, February 15, the National Symphony Orchestra played a special family concert of other sports-related music at the Kennedy Center, and Nationals TV broadcaster F.P. Santangelo read the famous poem, Casey at the Bat. 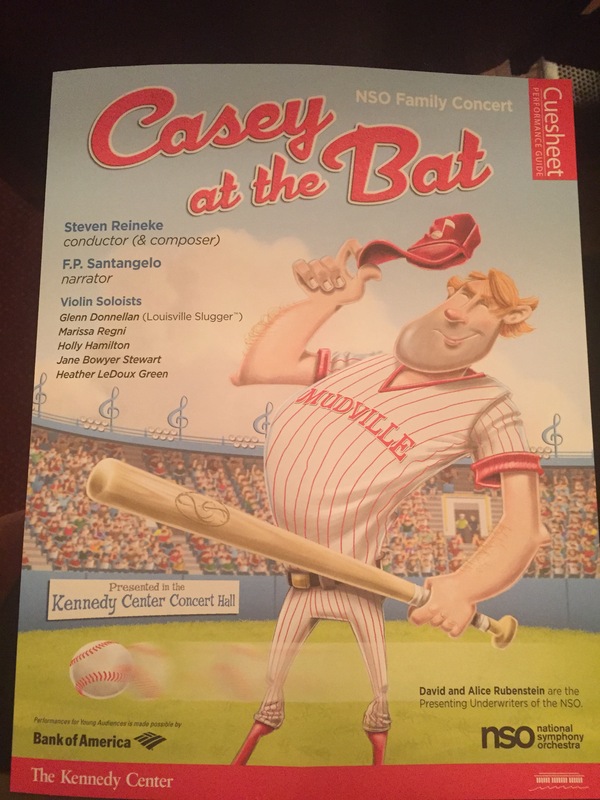 I was lucky enough to watch the concert and then go backstage to interview Glenn Donnellan, a member of the National Symphony Orchestra and creator/player of the Electric Slugger, or bat-olin, (an electric violin played on a Louisville Slugger baseball bat). 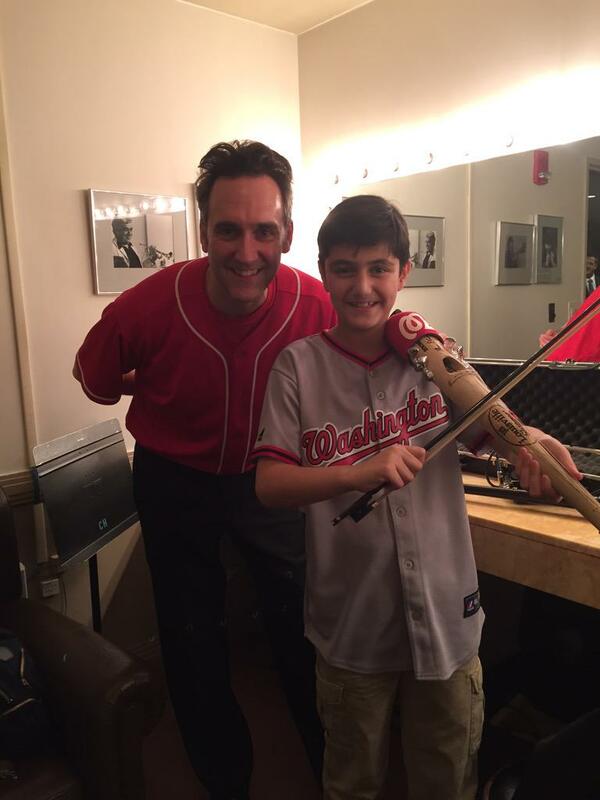 You may have seen him play him play the National Anthem on the Electric Slugger at a Nationals game. Before I get to my Matt’s Bats Chat with Glenn, let me tell you a little more about this awesome concert. We arrived at the Kennedy Center a little early so we could experience the orchestra “petting zoo” that happens before each NSO Family Concert. The petting zoo is where volunteers bring out different orchestra instruments for the children to play. I tried out the saxophone and violin, which I had never tried before. 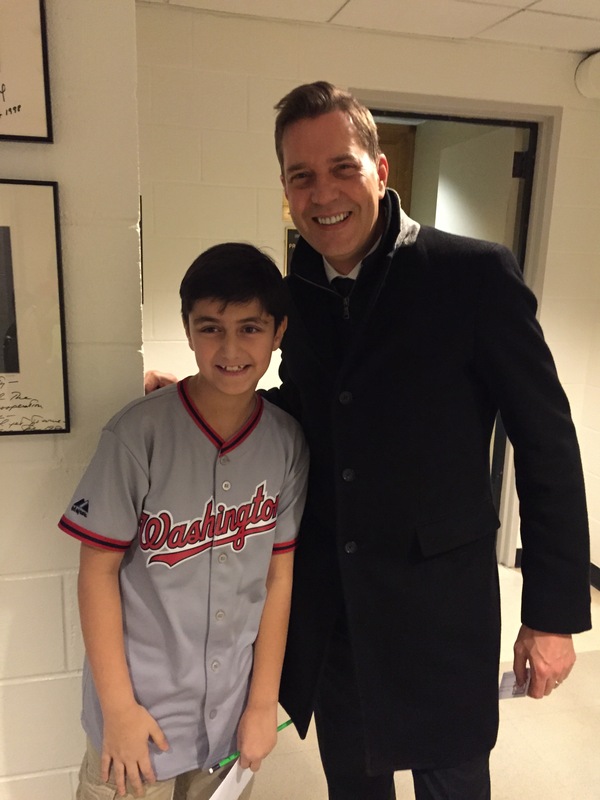 The National Symphony Orchestra, conducted by Steven Reineke, played lots of sports-related music, like the theme from Rocky, the Olympic Fanfare, and a song about Horse Racing. Then they got to Casey at the Bat. Casey is one of baseball’s most storied characters, after he let down Mudville by striking out in the ninth inning to lose a late-game rally. F.P. Santangelo recited the poem with the music in the background. The music really took you to Mudville and the game by doing drumrolls and organists played “Take Me Out To The Ballgame.” And I think that F.P. did a really good job reciting the poem in front of all of those people AND a symphony orchestra playing in the background. F.P. is the third Nationals broadcaster to do a performance of Casey at the Bat. In 2013, radio broadcasters Charlie Slowes and Dave Jageler recorded their versions of the poem for the Library of Congress to celebrate the 125th anniversary of the poem. Listen to Charlie Slowes HERE and Dave Jageler HERE. After that, the symphony played Take Me Out To The Ballgame with 4 violinists who acted out a real baseball game. And to conclude the show, they played Stars and Stripes Forever by Sousa. Everyone was talking about the Electric Slugger on the way out. The people had thought that it was the coolest thing they’d ever seen and were very impressed with their performance. And I was lucky enough to get to go backstage to interview Glenn Donnellan and try out his bat-olin. Here is my interview with Glenn! Matt’s Bats – Can you tell me a little bit more about yourself? Glenn Donnellan – I started violin when I was four years old. My mom taught public school strings in Washington State, in a small town called Ferndale. I grew up playing violin in our house and through the school system with my friends. I went to college to study violin performance at the University of Minnesota in Minneapolis. I first auditioned at The Minnesota Orchestra and the St. Paul Chamber Orchestras and sat as a substitute in their violin pools. It was great to have two top tier orchestras in the town where I was going to school. I got to hear them all the time and then I got to play with them, which was a dream come true. The Minnesota Orchestra is a “major league” orchestra on par with the National Symphony. We have major league orchestras, like baseball has major league teams. Then there are other orchestras that are considered “minor league” teams – those are the terms we actually use. The minor league orchestras are in smaller cities. After college I won a job with the National Symphony at an audition, which was just a “pinch myself” moment. I got to play music full time. MB – Tell me more about the Electric Slugger Bat-olin. GD – It’s a 34 inch Louisville Slugger, C271 model, 125 wood. Louisville Slugger and I chose this particular bat for me to turn into the Electric Slugger because it’s the most ubiquitous bat in the Majors. It’s the Louisville Slugger that you’ll find swung the most often on every Major League team. They might not be swinging it in a game, but the C271 Louisville Slugger is in their collection of bats. I thought it would be neat to have the most common one. Whenever I need a new Electric Slugger, Louisville Slugger will make one and ship it to me. I then can transform the bat into an Electric Slugger in my garage with my tools. Louisville Slugger also changes the logo, from “Genuine Louisville Slugger” to “Genuine Electric Slugger” and I get the heat-branded stamp. How cool is it that Louisville Slugger put his autograph on the bat?! The “Pro Blemish” bat you see above, means that there was some kind of mishap or imperfection with that bat when they were manufacturing for the pros. Lots of college and minor league players go to the Louisville Slugger factory in Louisville, Kentucky, when they play the UK or Louisville Bats teams to try out the Pro Blemish bats to see which one that they like the most. MB – How were you inspired to make it? GD – I played an electric violin in a young person’s concert that the National Symphony does from time to time during the school year. One of the concerts focused on “Music and Science.” Every piece the orchestra played that day had some kind of scientific aspect to it. The Horns section talked about condensation in the instrument and how it affects the sound. Then we wanted to show how an instrument sounds electrified and amplified, so I played the electric violin. I thought it sounded really cool so I decided to make one myself, and I ended up with the Electric Slugger. MB – How many times have you played the National Anthem at a baseball game? GD – Over a dozen, but I’ve lost count. But I need to go back and look, because I know I’ve got a winning record, the games that I play at the home team tends to win more often than not. MB – What does it feel like playing in a professional sports venue in front of 40,000 people? GD – Its really cool. I try to make sure I don’t hear the music or noise from the stadium speakers because the echo and delay can be very distracting. So I bring a small amp to the field that I stick in front of me and put a microphone in front of the amp. This is what guitar players do in rock concerts. I turn the amp up enough in front of me so I don’t hear the echo or delay coming from the stadium speakers and I can hear my music in real time. But the sound has an echo decay that makes the music sound really big and full in the stadium, which is really cool. I get to stand in the middle of this huge sound picture. MB – What other ballparks have you played in? GD – I played on a pink Louisville Slugger bat on Mother’s Day at Citi Field for the Mets to help promote Komen for the Cure. I’ve also played for the Atlanta Braves one time at Turner Field. I also play for the Orioles every year at Camden Yards. Here’s an MLB video of his Camden Yards performance. MB – So, are you a baseball fan? GD – Growing up, the Mariners were my home team, but I lived about two hours north of Seattle and never actually got to a baseball game when I was a kid. My first game was with the Minnesota Twins when I was in college. My cousin, a big Twins fan, took me. Kirby Pucket was the big player there at the time, so I became a Kirby Pucket fan. I still enjoy following the Mariners and the Twins, but now my favorite team is the Nationals, who have also been amazing to me and actively developed an incredible playing relationship. I’ve even started playing with their NatsTown organist, Matthew Van Hoose! MB – Do you have any interesting stories about when you have played the National Anthem at baseball games? GD – I’ve learned some cool things about playing in stadiums. The trick about using the personal amplifier when I perform came from the sound techs at Citi Field. My favorite moment was when I was playing “Take Me Out to the Ballgame” during the 7th inning stretch up on the dugout at Nats Park. Angel Hernandez, the home plate ump for that game, walked up to me and threw me a game ball after I finished playing. Then Joe West, another umpire, called me back to the Umpire Room, where no one gets to go unless they’ve been asked by the umpires. I brought my bat and speaker into the room, thinking they wanted to see the instrument. When I got into the room, Joe West looked at the bat and then handed me $500 and said “Make me one of those.” Turns out that Joe West plays fiddle and guitar and he actually has a couple country western albums out. That story is what started my two year odyssey to get the licensing agreement with Louisville Slugger, so I could make Joe West his bat-olin. That’s probably one of the best experiences I’ve had at the ballpark. MB – Have you met any players? GD – I’ve met a few players, but I try to stay out of the way when I’m playing at games. I need to stay professional. Sometimes players do come over to talk to me, but its just a random thing. MB – What helps you prepare for a performance? Are you superstitious? GD – I don’t have any superstitions. I just get myself into the right mental zone, where I’ll be able to focus and just let it happen. I remember Davey Johnson telling the guys on the Nats to just relax and let it go and you natural abilities will come out. When he used to talk about that, I felt that’s what we try to do as musicians too. We train and practice over and over again, so when its time to perform, we just let it go and let it happen. MB – Will you be playing at Nats Park again this year? GD – I will be playing at Nats Park this season, but they haven’t set any dates yet. I hope to get 3 or 4 games this year, but you never know! I hope you enjoyed this post as much as I did going to the Kennedy Center concert and interviewing Glenn. The NSO hosts family and child concerts pretty regularly, the next being The Magic Horn on March 29. Also, you can see Glenn spotlighted on April 11-12 with his wife Jan Chong at a NSO Teddy Bear Concert. He will also be at an NSO Kinderclassic event called Beethoven at the Ballpark on May 9 with the Nats Park organist Matthew Van Hoose. These concerts are great ways to get kids into music and the arts (I definitely like music more after going to the concert) and they have different concepts that can be very intriguing to go see. Only 42 days, or 3, 628,800 seconds, until Opening Day! Even though it is February, we are actually very close to the start of Spring Training and the return of baseball from the winter offseason. With baseball returning, we can think of lots of great Nats wins. Almost every great Nats win ends in a Gatorade bath. 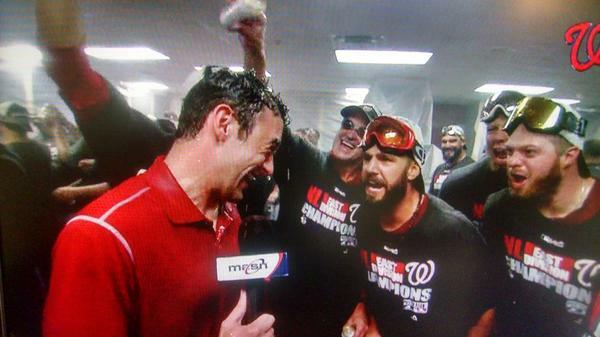 And almost every Gatorade bath ends up on Dan Kolko, sideline reporter for MASN (the Nationals’ TV broadcast station). Kolko became the MASN sideline reporter in 2014 and has been hilariously dunked with Cool Blue Gatorade many times in his first year. Recently, Dan did a Matt’s Bats Chat with me where he gave interesting behind-the-scenes descriptions of his job as a sideline reporter. I hope you enjoy it. 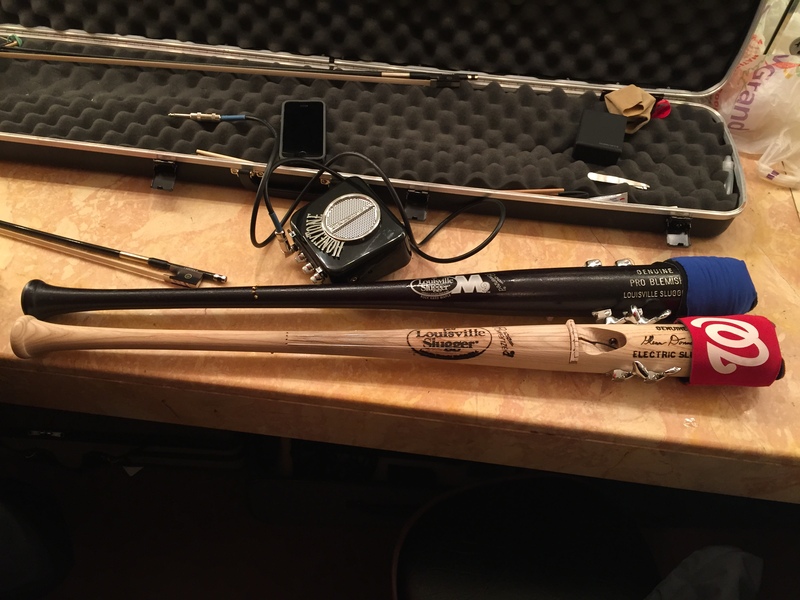 Matt’s Bats- First of all, can you tell me a bit of your background and how you got into broadcasting? Dan Kolko- I had a feeling I wanted to do some type of sports broadcasting back in high school, but really learned it was the right path for me in college. I started out at Dickinson College, a small Division-III school in Pennsylvania, and they didn’t have a student TV station there, but I did radio broadcasts of football, basketball and baseball games. I then transferred to the University of Delaware (which I love with all my heart), and got great experience there doing live TV broadcasts of football and men’s and women’s basketball games, both as a play-by-play guy and the color commentator. I also hosted a bi-weekly studio sports show for the student TV station, all of which was a blast. I always tell kids who want to break into the business to do as much as possible while in college. After college, I started working as a production assistant at Comcast SportsNet in Bethesda, and then was offered a job with MASN’s website, which back then was in its early stages. I did some behind-the-scenes stuff and also got a chance to do some writing, and was quickly given the chance to cover the Baltimore Ravens for the website. I covered the Ravens for four years doing mostly writing with a bit of on-air work, all the while knowing I’d still like to be on the TV side of things. 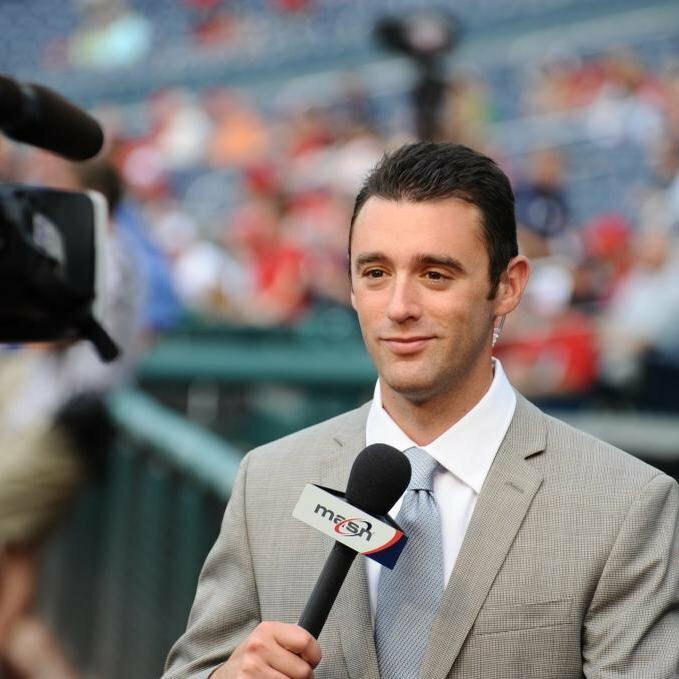 I then was bumped up to cover the Nats for MASN’s website in 2012, which allowed me more on-air opportunities. Last year, during a Nats-Astros spring training game in Kissimmee, Fla., I got a call from one of my bosses asking if I’d like to be the sideline reporter for our broadcasts. I said, “Heck yes, I would,” slapped myself in the face a couple times to make sure it wasn’t a dream, and went back to work. MB- When did you become a baseball fan? DK- I’m convinced I was a baseball fan the instant I was born. My parents tell stories about how as a toddler, I played with every tennis ball, baseball, golf ball, basketball I could find, and eventually, they had to chase them all over the place as I tried to learn how to throw. MB- Did you play baseball growing up? DK- I played ball as a kid, playing shortstop and pitching, but lagged behind most kids my age in middle school and early in high school because I was so skinny and always one of the shorter ones. Once I learned I had absolutely no chance of playing sports professionally, I tried to find a way to be around them in another capacity. MB- Who was your favorite player growing up? DK- My favorite player growing up – as was the case with most kids my age in the Maryland area – was Cal Ripken, Jr. I idolized the guy. MB- There’s been a lot of discussion about you coming back next season as the MASN sideline reporter. Is it official yet? DK- It is indeed official. I signed the contract last week, and will be back as the on-field reporter for 2015. The only difference this year is that I will no longer be covering the team for MASNsports.com. Handling two jobs was tough last year and was very time-consuming. This season, I’ll get to focus strictly on the TV side of things, with an occasional blog post possibly appearing on the site from time to time. MB- What have you done this offseason? DK- In the offseason, I try to spend as much time as possible doing the activities that I don’t get to do much of from March-September: travel, hang out with friends and family, work out and sleep. I’ve taken a couple trips this winter and spent a good bit of time with the people I care about, which has been great. MB- Tell me about the life you lead during the season. What is a normal day for you like? DK- Last season, I would write up a morning blog post on the site by 9:30 a.m., do some prep work for the game, get to the stadium around 2:30 p.m., conduct pregame interviews, meet with our in-game producer to discuss what reports I have for that night, prepare my pregame show material and my in-game material, do a segment (called a “hit” in the business) on Nats Xtra, then scarf down some dinner and do the game broadcast. Afterwards, it’s back into the clubhouse for postgame interviews, then I would head up to the press box to transcribe and write a postgame story. It made for fun days, but long days. This season, not writing means I’ll have my mornings to myself, which I hope will allow for trips to the gym and some added prep time. MB- What do you do during the game? Are you always in the camera well next to the dugout, or do you go up to the press box or into the clubhouse? DK- I’m in the camera well most of the game, but also pop up to the press box from time to time. I prepare a number of reports for each game, but they could become relevant at any time, so I have to be ready to go on-air if a certain report fits in that moment. I coordinate with our producer and the guys in our production truck throughout the game, and we decide when it makes sense to put me on. We try to get me in at some point in the first three innings. I come up with most topics myself, but sometimes one of my producers or F.P. will make a good suggestion. MB- How do you do all that avoid being hit by screaming line drive? DK- I had a few close calls last season, but survived unscathed. You’ve got to really pay attention down there in the camera well, or else you can get smoked. MB- How do you handle all the travel you do with the team as they play 81 road games? DK- Traveling so frequently definitely wears on you as the season goes on, and it’s tough feeling like you’re never really settled, even when you’re at home. I have suits and shirts and ties everywhere, dry cleaning and laundry all over the place. But our travel itself is made much easier by the fantastic team staffers. You miss out on beach trips and time with family and friends, which can be tough, but you get to be around baseball every day, which is great. MB- Do you become friends with the players or the other broadcasters or staff? DK- You do become friends with the other broadcasters and crew members, because you’re around each other so often. I’m friendly with players, but I still try and keep a professional balance, because I’m there to do a job, and sometimes that could mean asking tough questions of players and coaches. MB- How would you describe your job? Do you try to report just the facts like a journalist or be more of an entertainer or color commentator? DK- I see my job description as providing important information on news surrounding the team (injuries, updates from the manager, specific things a player might be working on, etc.) while also adding a bit of color to the broadcast. Bob Carpenter and F.P. Santangelo work hard to call the action on the field, and my role is to bring information from the clubhouse that can provide context or enhance the broadcast in some way. I work hard at that, but also pride myself on not taking myself too seriously, and so I’m willing to go down Bernie Brewer’s slide in Milwaukee or do a hit from above Tal’s Hill in Houston if it shows off something cool or adds to our broadcast. We’ll see about the whole kayak thing in San Francisco this year. I know I let a lot of people down by not making that happen last season. MB- What’s it like to be given a Gatorade bath after a win? Who pays for the cleaning? DK- The Gatorade baths are fun for the players and the fans. Less fun for my dry cleaning bill, which I take care of myself. No, they’re a blast, and it’s a nice way to top off a walk-off win. MB- Do you have a favorite color to be doused with? Do you have a change of clothes? I prefer a blue Gatorade bath – by far my favorite flavor to drink – but am good with anything but red, which stains easily. Gotta watch out for the suits, shirts and shoes. For one pregame hit last year, I chatted with Jerry Blevins and Drew Storen about the art of the Gatorade bath (http://www.masnsports.com/media.php?show_id=2295294&p=4), which was a cool segment. MB- Tell me about the clubhouse after the clinch in Atlanta– it looked crazy. DK- The clinch was a great night. The guys were really enjoying themselves, and I tried to work through all the beer and Champagne so that everyone back home could hear from all the players and staffers. I’m glad fans seemed to enjoy it. MB- A few one-word questions: Apple or Android? MB- Window or aisle seat? MB- Beach vacation or ski vacation? DK- Beach, without a doubt. Love the beach. DK- On the road, I love AT&T Park in San Francisco, Safeco Field in Seattle, PNC Park in Pittsburgh and Wrigley Field in Chicago. Tough for me to pick just one. MB- Favorite food to order at a game? DK- I’ve always loved nachos, but there’s something about a ballpark hot dog for me. DK- I’ll give two TV shows I absolutely love: The Wire and Seinfeld. MB- Is there a wrong pipe? DK- We all know the answer to this one, right? Thanks to Dan Kolko for this really great interview. It’s a great way to celebrate the fact that there are only 10 days until Pitchers and Catchers report! Max the dog is happy about that! Until the past couple of weeks, it had been a quiet offseason for the Washington Nationals. Then, they made a couple of big splashes with the Tyler Clippard-for-Yunel Escobar deal and the Max Scherzer signing. That also meant a lot of work for the newspaper writers on the Nationals beat–although not as much as once the season starts in and they start writing about the games every night. Before these two big headlines broke, I got a chance to speak with James Wagner, the head beat writer for the Washington Post about how he thought the Nationals’ offseason had been going. He also shared a little bit about how he came to the Post and what it’s like covering a professional baseball team for 162 games. This was another chance to go behind the scenes to see how baseball works off the field. So, here is my Matt’s Bats Chat with the Washington Post’s own James Wagner. 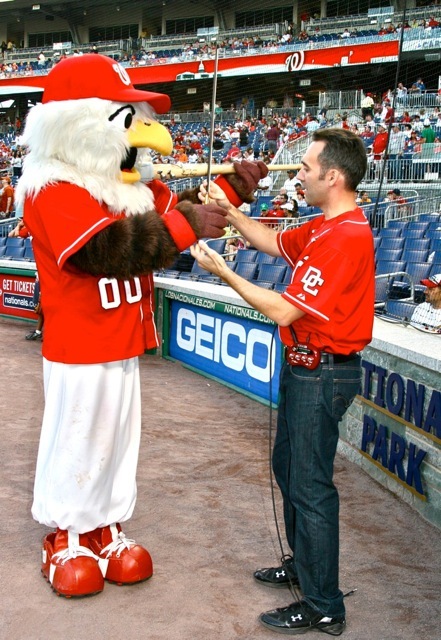 Matt’s Bats: Tell me a little bit more about yourself and how you got to be the Washington Post’s Nationals reporter? James Wagner: I grew up in Northern Virginia, but my dad used to work for the State Department so we moved around a lot when I was growing up. I was born in Alexandria, Virginia, lived in Springfield, Virginia, and then moved to the Philippines, Venezuela, Peru, Belgium and then back to the States. I finished high school at Lake Braddock. I went to the University of Virginia and studied Sociology. During college I knew I wanted to be a journalist and I worked at the school paper and had internships in news and sports. My first job was with the LA Times and I worked there for a few months before getting laid off. Then I worked for a small local newspaper in Los Angeles County for a year covering local news. I then moved to the Washington Post and covered high school sports for two years. I moved to cover the Nats in 2012 and I’ve been covering them ever since. MB: You spent a lot of time growing up overseas, how did you get interested in baseball? Was it the influence of Latin American sports? JW: The two most popular sports in Latin America are baseball and soccer. My mom is from Nicaragua, which is a baseball playing country, so I had that baseball influence from my grandfather. Baseball was also always a connection to home for me. Living overseas I was exposed a lot to baseball, but I would feel American when I watched and read about baseball, the NFL, and college sports. Naturally I think I gravitated more to baseball because I played Little League overseas and back home and it was supported by my family and my culture. I speak Spanish, which helps a lot when covering baseball. MB: So you played Little League and I notice your Twitter picture is of you in a uniform? Did you play for a lot of teams? JW: I played little league. I wouldn’t write home about it, but I played third base, caught, a little bit of outfield. Overseas it could be a little tougher to find leagues to play in, but every time I moved back to the United States in elementary school I would find a league to play in. I played little league and in high school. I even played for my high school team in Belgium, which played other international schools. I don’t think I was that good and I only had one career high school home run. But it was fun to play overseas. MB: So you’ve been covering the Nats since 2012 after covering high school sports before that. How did you get up to speed on the team and the issues they were facing? JW: While I was covering high school sports at the Post, I would always read up on the Nats and I watched games. I wasn’t as knowledgeable as I am now, but I had a general sense of what was going on. Sometimes while I was covering high school sports they would send me over to Nats Park to help out, maybe Opening Day or help out when someone took some days off. I would also sometimes get sent over to Nats Park to speak to a Spanish speaking player. So I was a little familiar with the team when I was added to the Nats beat with the great Adam Kilgore mid-way through the 2012 season. It’s not easy getting up to speed on a team, but if you ask questions people can help you out. It also helps to be around it every day. 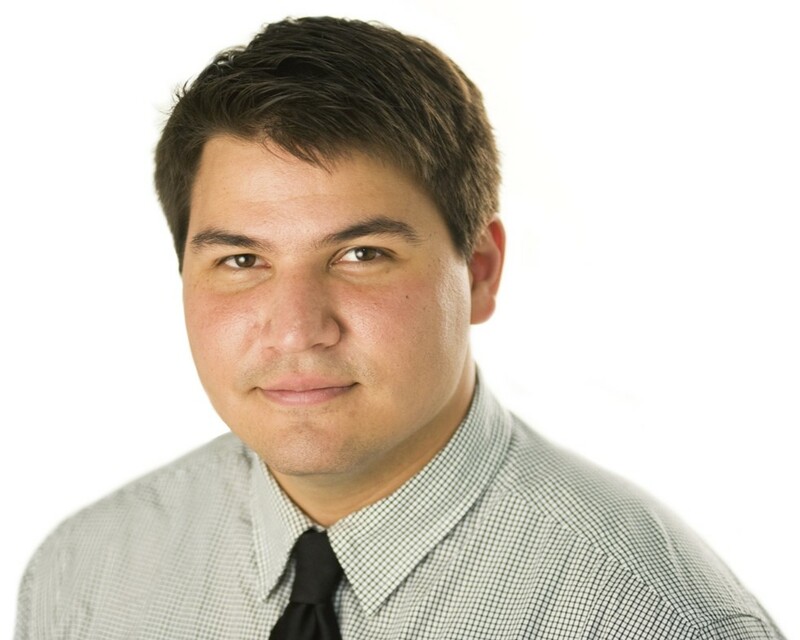 MB: Chelsea Janes, the new Nats reporter, also covered high school sports before joining the Nats beat. Is that something reporters need to do before they go to the Nats? JW: That’s a good observation. No, I don’t think you have to start out covering high school sports, but many people in the sports journalism world start there. It’s just the way you move your way up. You start somewhere, show your talent and ability and then move your way up. You don’t have to do it, but I bet most sports reporters started covering high school sports at the beginning of their careers. MB: What’s the hardest part of your job, being the beat reporter for the Nationals? JW: It’s hard to have enough time for the job – it’s a lot of work. It’s a huge time commitment, 162 games and 30 spring training games, plus the playoffs. Baseball is a grind and everyone knows it, for the players, the coaches, and the people around it every day. No other pro sports team has that many games. On a personal level, it’s tough to manage the stress, but that’s the nature of the job. There’s a lot of things that happen during the baseball season, you try to make sure you don’t get beat on a story, you make sure you write something well. You get pulled in a lot of different directions and there’s a lot to keep track of. As you get more experience you learn how to deal with it better, but there’s a lot to keep track of. But that’s the beauty of the sport: the everyday nature of baseball. MB: Can you explain your normal day as a reporter during the season? JW: During a normal regular season, 7pm game, I try to get to the stadium at 2:30pm to see the lineup go up, catch up on what I’m going to write for the day, get interviews, talk about what’s going well or not going so well with the team. Then I go down to the clubhouse and talk to the players for 30 or 40 minutes. We talk to Matt Williams around 4pm for his press conference – he talks to reporters before every game except on Sundays. Then we go to the field to watch batting practice and talk to some players there and watch the guys hit. There we talk to team officials. I then go up to the press box around 5:30pm to write the pre-game post. After that I watch and cover the game. I write the game story as it’s going on, so I can send it in to my editor right when the game ends, obviously without any quotes or anything. Then I go back down to the clubhouse and talk to the players and get some quotes. Then after that, it might be 11pm or midnight, I write a morning post too. The next morning I work on the longer feature story ideas, maybe transcribe interviews or work on some other longer form stories. I also take advantage of the mornings to keep in touch with the wide range of baseball contacts, everyone from agents to other people affiliated with the team, and things going on with other teams. Some days are really long, especially when we are traveling from city to city. MB: Now that you’ve visited all of the NL ballparks and most of the AL ballparks, what is your favorite press box to work in and why? JW: I haven’t been to all of the ballparks, but I’ve been to most. Citizens Bank Park in Philly has a pretty great press box to work in. Nats Park is really comfortable too, but the only complaint most people say is that you’re pretty high up in the air and its tough to see the game and specific pitches some times. I like AT&T Park in San Francisco, even though the space is a little tight. Coors Field and Marlins Park are also pretty nice. MB: The hitting in the postseason wasn’t great, other than Harper and Rendon. Have you talked to Matt Williams about why he didn’t move Harper up in the lineup to, like, where Adam LaRoche was hitting, and what do you think he’ll do this season? JW: Based on what Matt Williams has said, I think you will see Harper this season hitting probably 3, 4, or 5, but it depends on which pitcher they are facing. Guys on the team said they felt Harper turned the corner during the playoff series, even though it was only a couple of games. It was a good jumping off point for next season. Matt said that the reason Harper was hitting so low in the order, which was puzzling to some people, was that Harper was injured and struggling at the plate and it made more sense to put him in a lower pressure situation. You can argue with that or not, but I think that in time, based on what Matt has said, that Harper will move back up next season. MB: The Nats traded Zach Walters, a possible second base candidate, for Asdrubal Cabrera at the deadline last season, but now since Cabrera signed with the Rays, the Nats don’t have anything left from the deal except playoff losses. Do you think the Nats would have been better off trading Ryan Mattheus or Ross Detwiler? JW: That’s one that in hindsight the team might be thinking “shoot, we’d like to have Walters back.” They had a chance to play Walters at second, a position that wasn’t that familiar to him, but the team didn’t play him there too much. Zach was really bounced around. He played some second base at Syracuse. At one point the Nats even played Walters in left. Walters had a really strong arm, but he made a fair number of defensive errors when he was playing the middle infield in the minors. Zach’s strengths are a really strong throwing arm, power bat, and a physical player. The team gambled that at the trade deadline they needed a veteran contact hitter more than Walters in that moment. When you’re in the heat of the pennant race and you have a hole in your lineup and a need for someone to fill a position, you kind of have to make the move and then worry about the consequences later. At the time the Nats needed someone to solidify the infield with Zimmerman’s hamstring injury, especially with the playoffs looming. That trade was probably one of Mike Rizzo’s most “win now” moves. He traded for a guy for two months, where most of the time Rizzo trades for guys under control for more than just that season. In the moment you can’t really worry about it, you need someone now to win. In hindsight, the team didn’t get past the first round in the playoffs and you almost wish you still had the prospect. But at the time, that’s what you needed to do. MB: Have you heard about any extensions of Jordan Zimmermann or Ian Desmond? JW: Last I checked in it didn’t sound like anything was really brewing. Jordan Zimmermann’s agent and Mike Rizzo talked during the Winter Meetings, but it was more just to catch up and see where things stand, rather than working on a deal. So it doesn’t sound like anything is happening there. With Desmond it doesn’t sound like anything is happening on that front either. Reports keep mentioning Desmond’s name in trade rumors and possibilities and it’s kind of hard to imagine that extension talks are going on at the same time as they are engaging other teams in potential trades for him. It seems like there was more going on last offseason to extend Desmond than this off season. JW: That’s tough. The playoffs are so hard to predict. And I’m sure you’ve heard this before, but it really is a crapshoot, you don’t know where it’s going to go, especially in the short series first round of the playoffs. You play 162 games and then the season comes down to 5 games. The talent that got you through 162 games might not always come up in 5 games. Look at last year’s offense – they did better all season than they did during the 4 games against the Giants since it’s such a small sample size. You can’t really predict how you’re going to do in the playoffs. You need a plan, and then just hope you can get there. Once you get to the playoffs, you hope that your stars, the guys with the really stand out talent like Jordan Zimmermann and Bryce Harper, shine. You’d think the Nats are the favorite to repeat the NL East title, but nothing is a given. The Marlins are a better team. The Mets, you can be unsure about their offense, but their pitching is good. The Braves and the Phillies haven’t really gotten any better. You think the Nats have a good chance at repeating in the division but beyond that, who knows. The Cardinals got better in the off-season, with Jason Heyward. You have to think with the window they have to win, the Nats are really going to go for the World Series and try to win with this group. Thank you again to James Wagner who spent his time during the bustling offseason to do this Matt’s Bats chat. I can’t wait to read what he and rookie Chelsea Janes have to say this season in the Washington Post about the Nats. The good news is we have less than three weeks to wait for Spring Training baseball to start! Nationals reliever Aaron Barrett, from Evansville, Indiana, was a rookie in the 2014 season who made the Nationals major league team out of spring training. A 27-year old from Evansville, Indiana, Aaron was drafted by the Dodgers in 2006, the Twins in 2008, and the Rangers in 2009 before signing with the Nationals in 2010 out of Ole Miss. A right-handed late reliever, he got the Opening Day win for the Nats and made his postseason debut at the end of the season. His nickname is “The Bear.” In his rookie year, he posted a 3-0 record with 49 Ks and a 2.66 ERA. 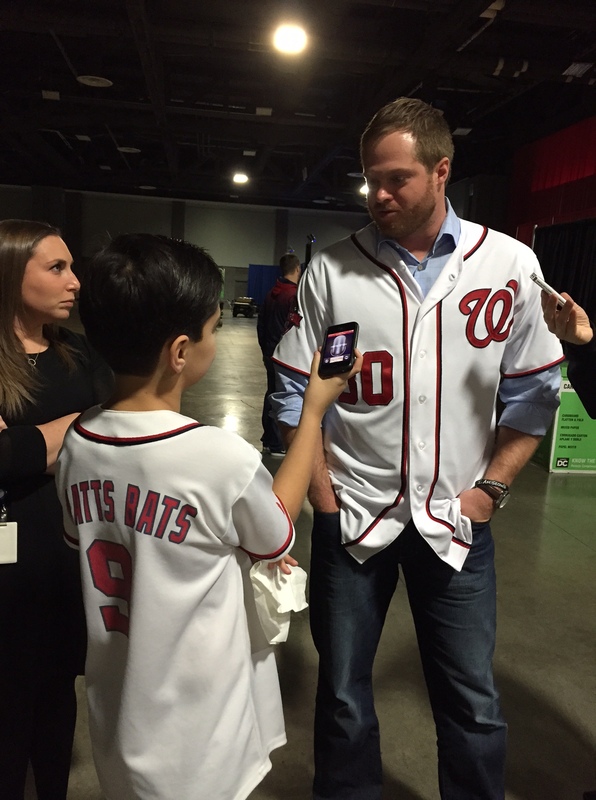 Aaron Barrett was at NatsFest, and I got the chance to catch up with him. Here is my Matt’s Bats Chat with Aaron Barrett. Matt’s Bats: What are you going to do this offseason? Aaron Barrett: I’ve been pretty busy. I’ve been traveling a little bit. My wife and I lived in Florida and just moved back to Atlanta and we’re in the process of getting a house in Atlanta. We went to an Ole Miss football game where they lost to Auburn, unfortunately, but we had a good time at Ole Miss. I’ve been training and hanging out and getting ready. MB: The playoffs ended in a disappointing manner for the Nationals and you probably weren’t happy with your Game 5 performance. How do you think you’re going to bounce back and what are your expectations for the year? AB: The season didn’t end the way we wanted it to. But, I’ve been put in that situation all year long. I was put in the game with the game on the line and sometimes you succeed and sometimes you fail. That’s the good thing about being a professional baseball player – you know you’re striving to be perfect, but you’re not going to be perfect every time. That outing and that experience I gained in the playoffs is only going to make me a better player and prepare me for the future. Hopefully this season I’ll get another shot at it and this time I’ll succeed. I’m ready to go! MB: Why did you decide to choose #30 as your jersey number? AB: I grew up being #30, not by choice, I just wore it. Ever since high school and college baseball it’s a number that stuck. I was fortunate when I got put on the roster, that was one of the numbers available. So I chose #30 and I like it! MB: What’s it like watching a game from the bullpen with guys like Craig Stammen, Tyler Clippard, and Drew Storen? It seems like a lot of fun. AB – It’s a lot of fun. The first four innings you’re just watching the game. They are good guys and I’ve learned a lot from them. I learn from their experience because they have been pitching for a long time in the big leagues. Being around them and hearing what they have to say is a cool experience for me. AB: I love it! It allows us to actually see the game! Instead of having to look through the wire fence, we’re elevated and we have a beautiful clear view. MB: Who was your favorite player growing up? AB: Albert Pujols. I grew up a Cardinals fan and he was my idol. I didn’t turn out to be a hitter like he is but I grew up wanting to be like him. MB: What’s your favorite ballpark to play in? In conclusion, I want to wish Aaron Barrett a happy 27th birthday. He just turned 27 on January 2. I also want to thank him for doing the interview with me and taking time out of his busy NatsFest schedule. I hope he has a great rest of his offseason. I look forward to seeing updates from Viera when pitchers and catchers report on February 19. I’m also looking forward to Opening Day and seeing his sophomore season in DC. 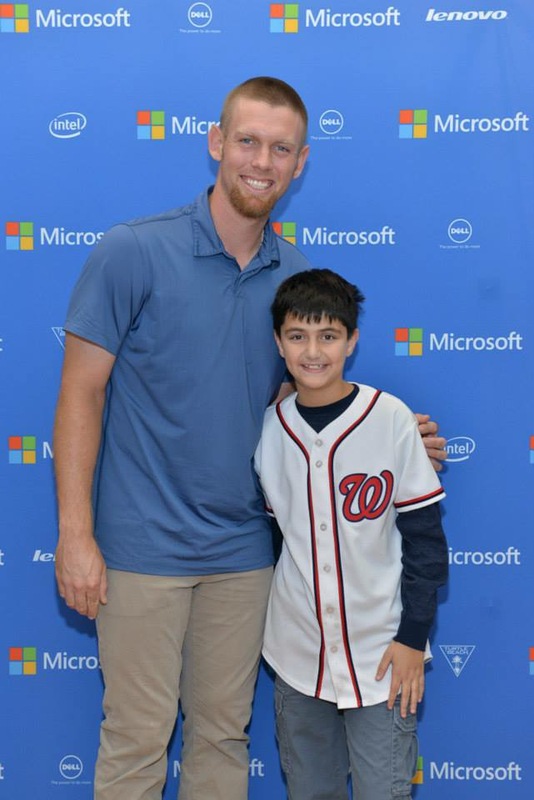 Have you ever wondered what its like to play Xbox with Nationals fireballer (and famous gamer) Stephen Strasburg? 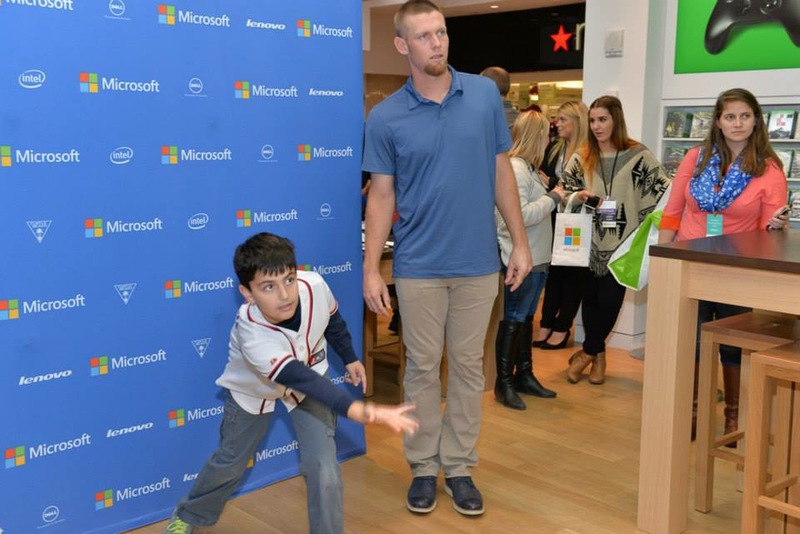 I was lucky enough to be one of the few Nats fans to have this cool experience when I went to the Microsoft Store opening at Westfield Montgomery Mall in Bethesda on November 22. 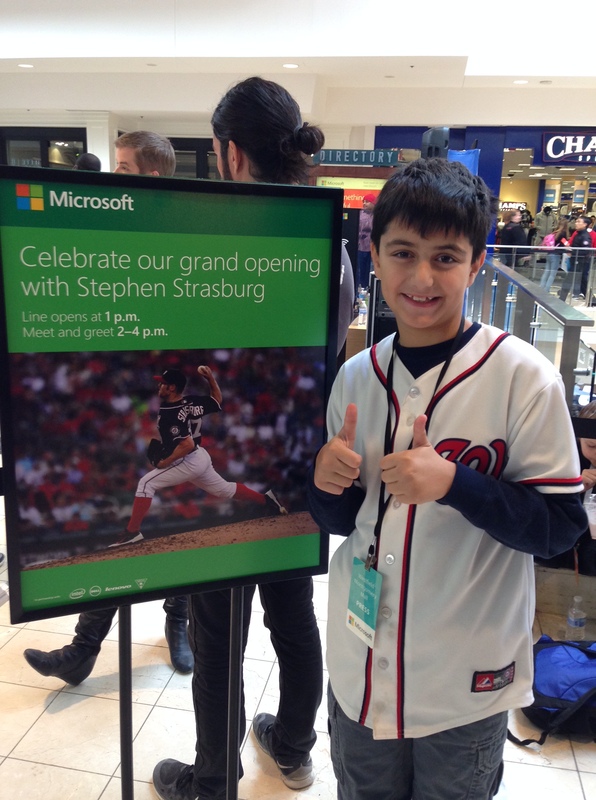 Two hundred lucky fans were allowed to take on Strasburg as part of the grand opening celebration, and Microsoft gave me a press pass to cover the event, interview Strasburg, and play game against him on Xbox. The Microsoft Store chose the game. We played Kinect Sports Rivals, a game that allows you to choose from a selection of sports game. The cool thing about Kinect is that you use your body to control the action, not a controller. Stras and I played bowling. Here’s no surprise: he was very competitive. I saw him throw down perfect strikes to kids younger than me. That, too is no surprise, that Strasburg can throw strikes. Strasburg was so fun to play against. It was awesome to see the determination and effort he put into every game he played with the fans. But here’s the surprising part of my day – I pulled out an unexpected win against him! He is well-known to be a huge fan of video games, so I was totally expecting that I would go in and lose big against him. Stephen Strasburg and I “bowling” in a game of Kinect Sports Rivals on Xbox One. It made me feel so good to win. I definitely didn’t expect it! Stephen took the loss pretty well. If you ever find your self playing Stras in Xbox, here’s a tip – just stay calm. I did, and I won. I was really lucky we didn’t play Call Of Duty or some other action game Strasburg usually plays because then I definitely would have lost. Strasburg definitely would have had the advantage if we played a driving game too. I once played Forza 5 – I’ll just say that I owed a lot to the fake body shop. The Bethesda Microsoft Store showed their dedication to the area by making technology grants to organizations like the Wounded Warriors Foundation, the YMCA Bethesda-Chevy Chase, the National 4-H Council, and the Imagination Stage, and others. The store has a variety of Windows 8.1 laptops, desktops, tablets, Xbox One and Xbox 360 consoles, games, controllers, and Kinect sensors, Microsoft smart bands, and Windows phones with a improved camera and Cortana. Earlier that morning. they cut the ribbon and officially opened the store for business. I happened to be the first non-Microsoft worker to set foot in the new store, which I think is amazing. Also as part of the store opening celebration, there were lots of raffle prizes. Some people won an Xbox One, a Jambox, and lots of gift cards to the Microsoft Store. I was lucky enough to win the one thing I wanted most: a signed Stephen Strasburg baseball! Stras signed it right smack on the sweet spot! 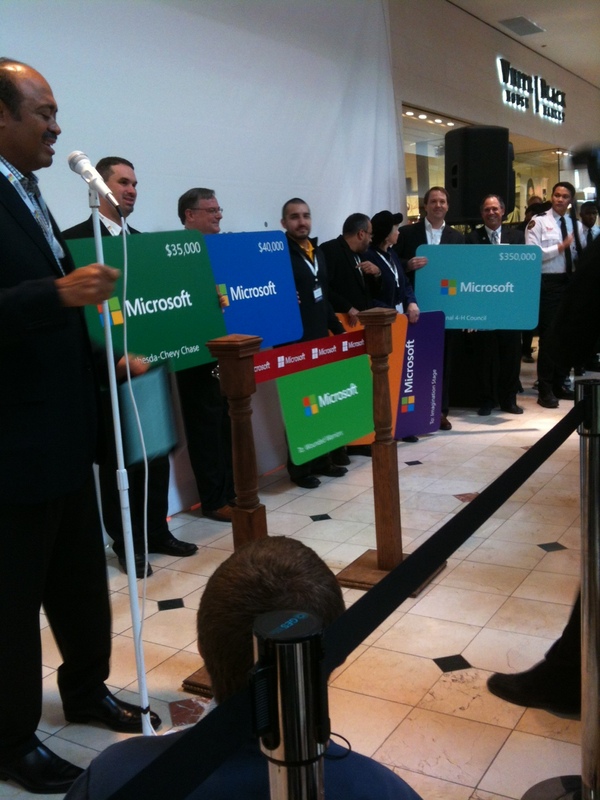 It was an amazing way to open the Microsoft Store at Montgomery Mall in Bethesda. Definitely check it out next time you are in the area, although hanging out with Stephen Strasburg is not guaranteed to happen again! 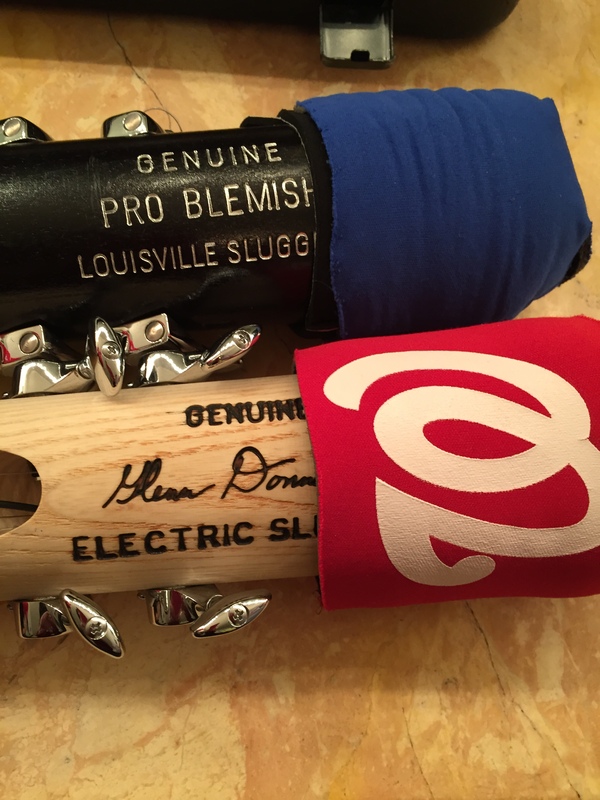 If you’re still deciding what to buy the kids in your life for the holidays, check out my 2014 Holiday Gift Guide https://mattsbats.com/2014/11/26/black-friday-holiday-gift-guide-for-2014-slash-2015/. I wrote it myself, so kids will definitely like it. Also, I am giving away a lot of cool products. The first round of giveaways is here: https://mattsbats.com/2014/11/28/giveaways-from-my-2014-holiday-gift-guide-for-kids/ and there are more to come!